Dr Valerie Bram shares some key insights into how companies can ensure they don’t lose their customers’ trust. 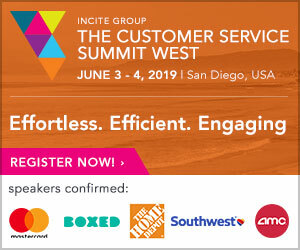 The current trend in national and multi-national companies is to create personal relationships with customers, and to treat them as individuals. Communication is more informal and is designed to convey the values of the company: caring, empathetic and trustworthy being the most frequently chosen characteristics that organisations want to project. How would you like to do business with a company you could trust – absolutely? Who wouldn’t want that? We not only want to trust, we need to trust. What a perfect foundation on which to build a powerful brand. Coca Cola promises to ‘refresh the world in mind, body and spirit.’ Apple guarantees ‘to create products based on seeing the world a little differently, and they promise to inspire their customers to do the same.’ British Gas vows to ‘look after your world.’ These are phenomenal undertakings. The ideas are inspiring and the words highly seductive. There is no doubt that words and phrases do have a powerful emotional impact. Of course, marketing and copyrighting teams have the skill to do this, but call centre staff or complaints handlers – they are often without the specialist know-how that would allow them to speak or write in a way that matches the brand. Yet across the world they interact with millions of customers every day and as far as the customer is concerned, they are the company. Trust is such a vital commodity these days that there are armies of people tracking it. The Edelman Trust Barometer Report for 2018, based on responses from 33,000 people in 28 markets, shows that things are not good. Two-thirds of the countries surveyed were “distrusters”. That is there is under 50% trust in the mainstream institution of business, government, NGOs (non-Government organisations) and the media. 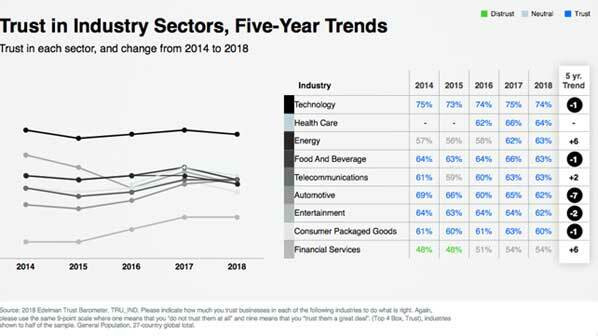 The graph and table above show a five-year trend in Trust in Industry Sectors. It’s what creates a bond, ‘the foundation of healthy relationships, between romantic or platonic partners, close friends, parents and children’ – or companies and their customers. And a bond is characterized by the two major emotions – trust and affection. The ESPC Europe Business School says much the same in its report. It states that ‘Trust is created through both emotional and rational bonds,’ over time and that between them, these bonds drive 22% and 44% loyalty. Reliability, truth or the ability of someone or something – that’s what human beings are programmed for. Which is why – when customers buy into corporate promises – the damage is irreparable when they find themselves let down. There are usually three major outcomes. First, there is often a financial price to pay. Enron’s accounting fraud saw its shares drop from $90 to $0.26 on its last day of trading. Its collapse affected thousands of employees and shook Wall Street to the core. In Europe, some €25bn of Volkswagen’s stock market value was lost when the emissions scandal first emerged.’ The company acknowledged the problem, owning up to the outcome of its behaviour and begging forgiveness. And it’s certainly true that a damaged reputation can last forever. 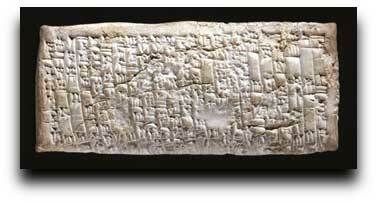 Note the customer’s complaint about Ea-nasir, who promised to sell Nanni Fine Copper in 1750 BC. We’re still reading about it 3,786 years after the event. By putting the complaint in writing Nanni makes sure there’s a written record for others to read. This is why Social Media is the preferred weapon of choice in this today’s world, somewhere all three outcomes can come together: financial loss, a damaged reputation and cathartic relief for customers determined to exact revenge. Let’s take one simple example – the video posted on YouTube by a Canadian singer whose $3,000 guitar was damaged by United Airlines. The clip has been viewed, 1,322,582 times at the last count. The whole world knows that the airline was totally indifferent to the customer’s loss. And the company’s shares dropped 10% as a result, racking up a loss of $180 million. So a financial loss, a damaged reputation and world-wide bad publicity. So what can companies do to ensure they don’t lose customers’ trust? First and foremost, they should keep their promises. 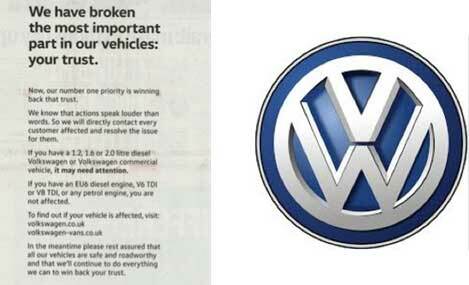 These can be the big brand promises full of superlatives that PR and Marketing craft, or everyday promises that staff make when they promise to call customers back or provide a service within a deadline. It really doesn’t matter what the magnitude of the promise is, it’s still a promise. This commitment to ethical behaviour has to be made at the top – and the entire organisation should live up to it. Naturally, there are occasions when a customer service representative doesn’t have the information the customer is expecting, in which case a telephone call to report on progress can head off accusations of unreliability. It just takes one broken promise to do the damage. There are people who say that it’s mature to expect that promises can’t always be kept. Try telling that to small children. They cut parents no slack if they’re in receipt of a promise, so as a parent, I quickly learned to say, ‘I’ll do it if I can – but I’m not promising.’ This is all about value systems and whether people can rely on you to do what you say you will. Paralanguage is an incredibly powerful aspect of telephone conversations and easily mastered with practice. Most of us know that words only constitute 7% of a message, 38% is in the paralanguage: volume, pitch, pace and tone. Creating tone in a written message usually involves mastery of five or more technical tools: register, active v passive verbs, sentence focus, harsh v soft negatives, degrees of formality. Anything that smacks of an indifferent or uncaring attitude is never going to engender trust. And finally, there are the words themselves. For centuries people have known that words can have a powerful effect on relationships – they can help forge bonds eliciting affection and trust. The truth is that it’s been scientifically proven these seven words are certain to make a good impression on customers, and you can be pretty sure to get you the right emotional response you want. The latest neuro-scientific research involving MRI scanning machines has long proved the impact of words on the emotional parts of the brain – of both sender of the message and receiver. Given the current trends tacked by the Edelman Barometer, it’s obvious that trust is rapidly diminishing all over the world. So it behoves companies to remember that the trend to treat customers as individuals and speak to them on a personal level, means that any perceived betrayal cuts deep and last long. Once lost trust can never be regained. Dr Valerie Bram is a Director of T2 Linguistics – www.t2linguistics.com. She specialises in the application of Psycho-Linguistics in the corporate world. For the past 28 years she has provided consultancy to major organisations world-wide. She has published extensively and spoken at international conferences. Currently, she is working in Dubai. 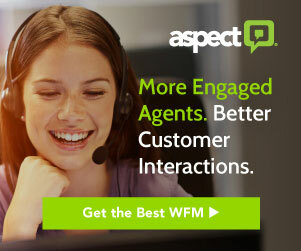 The Ultimate Customer Service Experience? Next article: Nobody Goes There Anymore… It’s Too Crowded! Changing Customer Demands – Is Your Business Keeping Up?